Kids Swimming Classes, Lessons: Why Choose Chicago Blue Dolphins? When it comes to choosing swimming classes for your child, there’s no shortage of options in Chicago. You may be inclined to choose classes close to home or that another parent mentioned. And until you’re child has spent some time in the class, it can be hard to know whether you’re getting quality instruction. We have the smallest class sizes of the major swim schools—a 3:1 ratio. We start with a strong emphasis on water comfort, independent floating and gliding. This ensure the children are relaxed in the water. To us, it’s crucial for them to be comfortable doing nothing but relaxing before they start to learn the swim strokes. We teach them to swim independently first. We do this by teaching elementary strokes on the front and back. And then, we add in the more complex competitive swim strokes. We use the best teaching methods in the market. Our learning progressions build strokes that can scale up to swim teams and competitions. Our learning environments scale with your child’s skills and comfort. The Endless Pools at our Swim Studio are small, cozy and warm. This helps more anxious swimmers relax and learn. 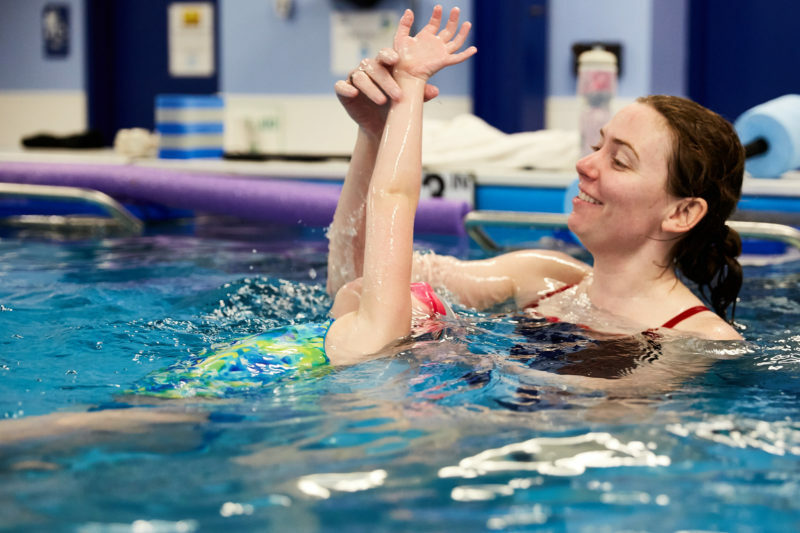 We also offer classes at pools with a deep end, so children can get comfortable swimming longer distances through water where they can’t touch the bottom. We offer small group, private and semi-private options. You can easily shift between the type based on your schedule and your desire for group or one-on-one attention for your child. We hire coaches who have great “pool-side manner” with our younger swimmers. They’re positive, patient, passionate and fun-loving. Our coaches also have strong swimming backgrounds: They know how to build everything from the simplest skills to beautiful, fast and flowing competitive strokes. If your child is already swimming with us, we hope this helps you understand our teaching methods. If you’re looking for a swim school for your child, we invite you to email or call us with any questions, schedule a visit or sign up today!